Clayton Thorson drops back to pass. The sophomore threw for three touchdowns and ran for another against Iowa. IOWA CITY, Iowa — Maybe Northwestern just needed to get away. After a 1-3 start to the season which culminated in a Big Ten opener loss to Nebraska last week, the Wildcats (2-3, 1-1 Big Ten) visited drizzly Iowa Saturday for their first road game of the season, emerging with a 38-31 win. NU’s offense exploded against the Hawkeyes (3-2, 1-1), as a mixed attack rolled up 38 points and 362 total yards. It was the first time the Cats scored more than 30 points on the road since they faced Notre Dame on Nov. 15, 2014. The first quarter had a certain symmetry, with both teams punching in touchdowns after long punt returns set their offenses up inside the 10-yard-line. A touchdown pitch-and-catch from sophomore quarterback Clayton Thorson to senior Austin Carr put the Cats up 17-7 early in the second quarter. But the last ten minutes of the first half would go Iowa’s way: the Hawkeyes used another long punt return and a fumble recovery to set up a pair of short touchdown drives, taking a 21-17 lead into halftime. It didn’t take long for Iowa to extend its lead to 24-17 in the second half, as a 38-yard punt return set up a Hawkeyes field goal with 11:29 left in the third quarter. From that point on, it was all Cats. NU evened the score at 24 minutes later when Thorson scrambled out of the pocket and connected with a diving Carr in the end zone. Later in the quarter, a 58-yard touchdown rush from Justin Jackson gave NU the lead. The Cats extended that lead to 38-24 when Carr reeled in his third touchdown catch of the day early in the fourth quarter. Iowa scored with 8:10 left in the fourth quarter to give the game its final score, but NU’s defense preserved the lead, as an interception by redshirt freshman Trae Williams in the final minute sealed the victory. NU junior linebacker Brett Walsh suffered an injury on a kickoff return in the third quarter. Walsh was carted off the field and taken to a hospital but was fully conscious and moving all extremities. 1. The NU rush defense is back. After surrendering 310 rushing yards to Nebraska’s spread attack last week, NU’s defensive front seven made a statement against Iowa. The Hawkeyes, known for their ground-and-pound offensive attack, ran consistently but ineffectively, finishing with just 79 yards on 41 attempts. 2. NU’s kick coverage needs some work. 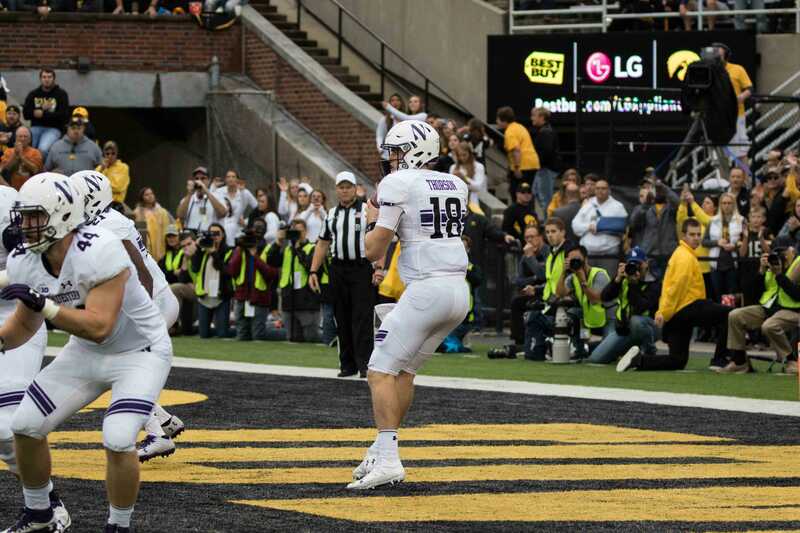 Sophomore Flynn Nagel’s aggressive approach to punts has been a highlight early this season for the Cats, and he broke off a big one in the first quarter against Iowa, but NU wasn’t able to get it done on the other side of Saturday’s punts and kickoffs. Iowa finished with 115 punt return yards and 139 kick return yards. 3. The year of Austin Carr continued. The senior further cemented his status as Thorson’s go-to wide receiver and one of the Big Ten’s best wideouts with a three touchdown performance. It was Carr’s fourth straight game with a touchdown reception.